This article is about machines used for audio (sound) recording. For video recording, see video tape recorder. For the tape systems used for computer data, see tape drive. An audio tape recorder, tape deck, or tape machine is a sound recording and reproduction device that records and plays back sounds usually using magnetic tape for storage. In its present-day form, it records a fluctuating signal by moving the tape across a tape head that polarizes the magnetic domains in the tape in proportion to the audio signal. Tape-recording devices include the reel-to-reel tape deck and the cassette deck, which uses a cassette for storage. The use of magnetic tape for sound recording originated around 1930 in Germany as paper tape with oxide lacquered to it. Prior to the development of magnetic tape, magnetic wire recorders had successfully demonstrated the concept of magnetic recording, but they never offered audio quality comparable to the other recording and broadcast standards of the time. This German invention was the start of a long string of innovations that have led to present day magnetic tape recordings. Magnetic tape revolutionized both the radio broadcast and music recording industries. It gave artists and producers the power to record and re-record audio with minimal loss in quality as well as edit and rearrange recordings with ease. The alternative recording technologies of the era, transcription discs and wire recorders, could not provide anywhere near this level of quality and functionality. Since some early refinements improved the fidelity of the reproduced sound, magnetic tape has been the highest quality analog recording medium available. As of the first decade of the 21st century, analog magnetic tape has been largely replaced by digital recording technologies. The earliest known audio tape recorder was a non-magnetic, non-electric version invented by Alexander Graham Bell's Volta Laboratory and patented in 1886 (U.S. Patent 341,214). It employed a 3⁄16-inch-wide (4.8 mm) strip of wax-covered paper that was coated by dipping it in a solution of beeswax and paraffin and then had one side scraped clean, with the other side allowed to harden. The machine was of sturdy wood and metal construction, and hand-powered by means of a knob fastened to the flywheel. The wax strip passed from one eight-inch reel around the periphery of a pulley (with guide flanges) mounted above the V-pulleys on the main vertical shaft, where it came in contact with either its recording or playback stylus. The tape was then taken up on the other reel. The sharp recording stylus, actuated by a vibrating mica diaphragm, cut the wax from the strip. In playback mode, a dull, loosely mounted stylus, attached to a rubber diaphragm, carried the reproduced sounds through an ear tube to its listener. Both recording and playback styluses, mounted alternately on the same two posts, could be adjusted vertically so that several recordings could be cut on the same 3⁄16-inch-wide (4.8 mm) strip. While the machine was never developed commercially, it was an interesting ancestor to the modern magnetic tape recorder which it resembled somewhat in design. The tapes and machine created by Bell's associates, examined at one of the Smithsonian Institution's museums, became brittle, and the heavy paper reels warped. The machine's playback head was also missing. Otherwise, with some reconditioning, they could be placed into working condition. The waxed tape recording medium was inferior to Edison's wax cylinder medium, and Edison's wax cylinder phonograph became the first widespread sound recording technology, used for both entertainment and office dictation. Franklin C. Goodale adapted movie film for analog audio recording. He received the patent for his invention in 1909. The celluloid film was inscribed and played back with a stylus, in a manner similar to the wax cylinders of Edison's gramophone. The patent description states that the machine could store six records on the same strip of film, side by side, and it was possible to switch between them. In 1912, a similar process was used for the Hiller talking clock. In 1932, after six years of developmental work, including a patent application in 1931, Merle Duston, a Detroit radio engineer, created a tape recorder capable of recording both sounds and voice that used a low-cost chemically treated paper tape. During the recording process, the tape moved through a pair of electrodes which immediately imprinted the modulated sound signals as visible black stripes into the paper tape's surface. The sound track could be immediately replayed from the same recorder unit, which also contained photoelectric sensors, somewhat similar to the various sound-on-film technologies of the era. Magnetic recording was conceived as early as 1878 by the American engineer Oberlin Smith and demonstrated in practice in 1898 by Danish engineer Valdemar Poulsen. 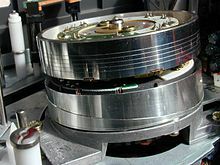 Analog magnetic wire recording, and its successor, magnetic tape recording, involve the use of a magnetizable medium which moves with a constant speed past a recording head. An electrical signal, which is analogous to the sound that is to be recorded, is fed to the recording head, inducing a pattern of magnetization similar to the signal. A playback head can then pick up the changes in magnetic field from the tape and convert it into an electrical signal to be amplified and played back through a loudspeaker. Magnetic wire recorder, invented by Valdemar Poulsen, 1898. It is exhibited at Brede works Industrial Museum, Lyngby, Denmark. The first wire recorder was the Telegraphone invented by Valdemar Poulsen in the late 1890s. Wire recorders for law/office dictation and telephone recording were made almost continuously by various companies (mainly the American Telegraphone Company) through the 1920s and 1930s. These devices were mostly sold as consumer technologies after World War II. Widespread use of the wire recording device occurred within the decades spanning from 1940 until 1960, following the development of inexpensive designs licensed internationally by the Brush Development Company of Cleveland, Ohio and the Armour Research Foundation of the Armour Institute of Technology (later Illinois Institute of Technology). These two organizations licensed dozens of manufacturers in the U.S., Japan, and Europe. Wire was also used as a recording medium in black box voice recorders for aviation in the 1950s. Consumer wire recorders were marketed for home entertainment or as an inexpensive substitute for commercial office dictation recorders, but the development of consumer magnetic tape recorders starting in 1946, with the BK 401 Soundmirror, using paper-based tape, quickly drove wire recorders from the market. In 1924 a German engineer, Dr. Kurt Stille, developed the Poulsen wire recorder as a dictating machine. The following year a fellow German, Louis Blattner, working in Britain, licensed Stille's device and started work on a machine which would instead record on a magnetic steel tape, which he called the Blattnerphone. The BBC installed a Blattnerphone at Avenue House in September 1930 for tests, and used it to record King George V's speech at the opening of the India Round Table Conference on 12 November 1930. Though not considered suitable for music the machine continued in use and was moved to Broadcasting House in March 1932, a second machine also being installed. In 1933, the Marconi Company purchased the rights to the Blattnerphone, and newly developed Marconi-Stille recorders were installed in the BBC's Maida Vale Studios in March 1935. The quality was slightly improved, though it still tended to be obvious that one was listening to a recording, as was the reliability. A reservoir system containing a loop of tape helped to stabilize the speed (there was also a smaller one just before the heads). The tape was 3mm wide and travelled at 1.5 metres/second. By September there were three recording rooms, each with two machines. Magnetic tape recording as we know it today was developed in Germany during the 1930s at BASF (then part of the chemical giant IG Farben) and AEG in cooperation with the state radio RRG. This was based on Fritz Pfleumer's 1928 invention of paper tape with oxide powder lacquered to it. The first practical tape recorder from AEG was the Magnetophon K1, demonstrated in Germany in 1935. Eduard Schüller of AEG built the recorders and developed a ring-shaped recording and playback head. It replaced the needle-shaped head which tended to shred the tape. Friedrich Matthias of IG Farben/BASF developed the recording tape, including the oxide, the binder, and the backing material. Walter Weber, working for Hans Joachim von Braunmühl [de] at the RRG, discovered the AC biasing technique, which radically improved sound quality. During World War II, the Allies noticed that certain German officials were making radio broadcasts from multiple time zones almost simultaneously. Analysts such as Richard H. Ranger believed that the broadcasts had to be transcriptions, but their audio quality was indistinguishable from that of a live broadcast and their duration was far longer than was possible even with 16 rpm transcription discs. (The Allies were aware of the existence of the pre-war Magnetophon recorders, but not of the introduction of high-frequency bias and PVC-backed tape.) In the final stages of the war in Europe, the Allied capture of a number of German Magnetophon recorders from Radio Luxembourg aroused great interest. These recorders incorporated all the key technological features of modern analog magnetic recording and were the basis for future developments in the field. Development of magnetic tape recorders in the late 1940s and early 1950s is associated with the Brush Development Company and its licensee, Ampex. The equally important development of the magnetic tape media itself was led by Minnesota Mining and Manufacturing (3M) corporation. American audio engineer John T. Mullin and entertainer Bing Crosby were key players in the commercial development of magnetic tape. Mullin served in the U.S. Army Signal Corps and was posted to Paris in the final months of WWII. His unit was assigned to find out everything they could about German radio and electronics, including the investigation of claims that the Germans had been experimenting with high-energy directed radio beams as a means of disabling the electrical systems of aircraft. Mullin's unit soon amassed a collection of hundreds of low-quality magnetic dictating machines, but it was a chance visit to a studio at Bad Nauheim near Frankfurt while investigating radio beam rumours, that yielded the real prize. Bing Crosby, a top movie and singing star, was stunned by the amazing sound quality and instantly saw the huge commercial potential of the new machines. Live music was the standard for American radio at the time and the major radio networks didn't permit the use of disc recording in many programs because of their comparatively poor sound quality. Crosby disliked the regimentation of live broadcasts 39 weeks a year, preferring the recording studio's relaxed atmosphere and ability to retain the best parts of a performance. He had asked NBC to let him pre-record his 1944–45 series on transcription discs, but the network refused, so Crosby had withdrawn from live radio for a year. ABC agreed to let him use transcription discs for the 1946–47 season, but listeners complained about the sound quality. Keen to make use of the new recorders as soon as possible, Crosby invested $50,000 of his own money into the Californian electronics company Ampex, and the tiny six-man concern (headed by Alexander M. Poniatoff, whose initials became part of the company name) soon became the world leader in the development of tape recording, revolutionising radio and recording with its famous Model 200 tape deck, issued in 1948 and developed directly from Mullin's modified Magnetophons. In 1963 The Beatles were allowed to enhance their recordings at the BBC by overdubbing. The BBC didn't have any multi track tapes. They would copy them onto another tape. The 8-track tape standard, promoted by Bill Lear in the early 1960s, popularized consumer audio playback in automobiles. 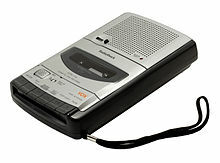 Eventually, this standard was replaced by the smaller and more reliable Compact Cassette. Philips' development of the Compact Cassette in 1963 and Sony's development of the Walkman in 1979 led to widespread consumer use of magnetic audio tape. In 1990, the Compact Cassette was the dominant format in mass-market recorded music. The development of Dolby noise reduction technology in the 1960s brought audiophile quality recording to the Compact Cassette also contributing to its popularity. Dynamic range compression during recording and expansion during playback expanded the available dynamic range and improved the signal-to-noise ratio. dbx and Dolby Laboratories introduced add-on products in this area, originally for studio use, and later in versions for the consumer market. In particular, "Dolby B" noise reduction became very common in all but the least expensive cassette tape recorders. Computer-controlled analog tape recorders were introduced by Oscar Bonello in Argentina. The mechanical transport used three DC motors and introduced two new advances: automated microprocessor transport control and automatic adjustment of bias and frequency response. In 30 seconds the recorder adjusted its bias for minimum THD and best frequency response to match the brand and batch of magnetic tape used. The microprocessor control of transport allowed fast location of any point on the tape. Electric current flowing in the coils of the tape head creates a fluctuating magnetic field. This causes the magnetic material on the tape, which is moving past and in contact with the head, to align in a manner proportional to the original signal. The signal can be reproduced by running the tape back across the tape head, where the reverse process occurs – the magnetic imprint on the tape induces a small current in the read head which approximates the original signal and is then amplified for playback. Many tape recorders are capable of recording and playing back at once by means of separate record and playback heads in line or combined in one unit. The storage of an analogue signal on tape works well, but is not perfect. In particular, the granular nature of the magnetic material adds high-frequency noise to the signal, generally referred to as tape hiss. Also, the magnetic characteristics of tape are not linear. They exhibit a characteristic hysteresis curve, which causes unwanted distortion of the signal. Some of this distortion is overcome by using an inaudible high-frequency AC bias signal when recording, though the amount of bias needs careful adjustment for best results. Different tape material requires differing amounts of bias, which is why most recorders have a switch to select this (or, in a cassette recorder, switch automatically based on cutouts in the cassette shell). Additionally, systems such as Dolby noise reduction systems (Dolby B, Dolby C, Dolby S and Dolby HX-Pro) have been devised to ameliorate some noise and distortion problems. Variations in tape speed cause flutter, which can be reduced by using dual capstans. Higher speeds used in professional recorders are prone to cause "head bumps," which are fluctuations in low-frequency response. Multitrack technology enabled the development of modern art music and one such artist, Brian Eno, described the tape recorder as "an automatic musical collage device". Within a few years of the introduction of the first commercial tape recorder, the Ampex 200 model, launched in 1948, American musician-inventor Les Paul had invented the first multitrack tape recorder, bringing about another technical revolution in the recording industry. Tape made possible the first sound recordings totally created by electronic means, opening the way for the bold sonic experiments of the Musique Concrète school and avant garde composers like Karlheinz Stockhausen, which in turn led to the innovative pop music studio recordings of artists such as Frank Zappa, The Beatles and The Beach Boys. Tape enabled the radio industry for the first time to pre-record many sections of program content such as advertising, which formerly had to be presented live, and it also enabled the creation and duplication of complex, high-fidelity, long-duration recordings of entire programs. It also, for the first time, allowed broadcasters, regulators and other interested parties to undertake comprehensive logging of radio broadcasts for legislative and commercial purposes, leading to the growth of the modern media monitoring industry. Innovations, like multitrack recording and tape echo, enabled radio programs and advertisements to be pre-produced to a level of complexity and sophistication that was previously unattainable and tape also led to significant changes to the pacing of program content, thanks to the introduction of the endless-loop tape cartridge. While they are primarily used for sound recording, tape machines were also important for data storage before the advent of floppy disks and CDs, and are still used today, although primarily to provide an offline backup to hard disk drives. There are many tape speeds which are in use in all sorts of tape recorders. Speed may be expressed in centimeters per second (cm/s) or in inches per second (in/s). History of sound recording – Magnetic recording – Magnetic tape in the context of the history of sound recording. Multitrack recording – Advanced usage of sophisticated tape recorders. Reel-to-reel audio tape recording – Details of using old style recorders. ^ a b Newville, Leslie J. Development of the Phonograph at Alexander Graham Bell's Volta Laboratory, United States National Museum Bulletin, United States National Museum and the Museum of History and Technology, Washington, D.C., 1959, No. 218, Paper 5, pp.69–79. Retrieved from ProjectGutenberg.org. ^ USPTO. Official Gazette Of The United States Patent Office, United States Patent Office, 1936, Volume 463, pp.537. ^ USPTO. United States Patent Office, Patent US2030973 A, "Method of and apparatus for electrically recording and reproducing sound or other vibrations"
^ Popular Science. Record Of Voice Now Made On Moving Paper Tape, Popular Science, Bonnier Corporation, February 1934, pp.40, Vol. 124, No. 2, ISSN 0161-7370. ^ Onosko, Tim. Wasn't The Future Wonderful? : A View Of Trends And Technology From The 1930s: (article) Book Reads Itself Aloud: After 500 Years, Books Are Given Voice, Dutton, 1979, pp.73, ISBN 0-525-47551-6, ISBN 978-0-525-47551-4. Article attributed to: Popular Mechanics, date of publication unstated, likely c. February 1934. ^ Smith, Oberlin (1888 September 8) "Some possible forms of phonograph," The Electrical World, 12 (10) : 116–117. ^ Poulsen, Valdemar, "Method of recording and reproducing sounds or signals," U.S. Patent no. 661,619 (filed: 1899 July 8 ; issued: 1900 November 13). ^ a b "BRUSH DEVELOPMENT CORP". The Encyclopedia of Cleveland History. 29 May 2002. ^ Martel Electronics. Terms commonly used for Tape Recorder. Tape Recorder Speed. Wikimedia Commons has media related to Tape recorders. Description of the recording process with diagrams. pg. 2, pg. 3, pg. 4, pg. 5. Recording at the BBC – a brief history of various sound recording methods used by the BBC. This page was last edited on 11 March 2019, at 20:15 (UTC).